As discussed in Chapter 1, our adaptation of 4.48 Psychosis set out to explore and develop a wide range of techniques using spoken, sung and projected text, and combinations thereof. Musical, semantic/literary and theatrical aspects were taken into consideration when developing these techniques. Whilst the opera also includes singing in many forms, this commentary focusses on non-sung text. Five varying approaches to dealing with non-sung text have been selected from the opera and will be discussed here. These five strands cover something of a taxonomy of explorations of non-sung text that appear in various guises throughout the opera, although only specific, archetypal examples of each technique are given in this commentary. These examples will be placed in the context of some of my previous work where this is helpful to illustrate the development and implementation of these techniques, and I will refer to other artists’ work where it has provided a specific model. A synchronisation of solo sung gesture and voiceover, to indicate the inner thoughts of the performer who is singing. Examples: Scene 5A, Scene 18. Pre-recorded voice over music, with or without projected text. Examples: Scene 11, Scene 14, Scene 16. Singers switch from sung to spoken text mid-phrase. Implementing cut-and-splice and stuttering/scratching techniques to make stream-of-consciousness spoken text, in live-performed versions and tape versions. Notation in ‘speech time’ rather than musical (metric) time. Example: Scene 5B, plus previous works Unleashed (2012) and Illusions (2015). Dialogue scenes where projected text is synchronised with two percussion soloists. Examples: Scenes 6, Scene 23, plus Skinner Box (2010) by Ignas Krunglevičius. The Doctoral Composer in Residence scheme is a cooperation between the Guildhall School of Music & Drama and the Royal Opera House. It gives the composer three years in which to conceive, research, write and workshop a full-length opera that is then produced by both organisations and presented in the Royal Opera season. The workshop element is a crucial part of the doctoral research, in that, unlike the traditional commission-and-deliver process for making new opera, it allows compositional issues to be explored, tested and revised. 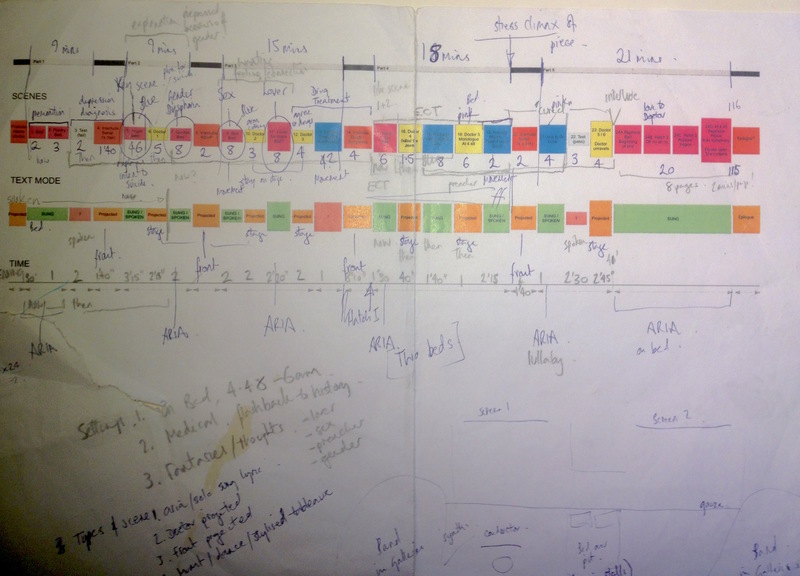 Below is a brief description of the timeline of this three-year residency, including each workshop or consultation that took place, and a brief description of which of the five strands of enquiry outlined above were affected by each workshop. Of course, some of the workshops were useful for other aspects of the opera that are not covered by this commentary, but they are listed here for completeness. The aim at the outset of the residency was to collaborate with a playwright on an original piece, as discussed in Chapter 2. Therefore the first year was spent meeting theatre writers, producers, directors and other consultants (facilitated by the Royal Opera House), as well as seeing and reading many plays in London and Berlin. Following this period of groundwork, initial meetings with Simon Kane took place in July 2014 and the rights offer was agreed verbally in November 2014 and contractually in March 2015. Three days of workshops in GSMD Silk Street Theatre, involving three singers (soprano, tenor, baritone), one viola player, one horn player and two technical theatre students on sound. In these workshops we explored techniques relating to live stream-of-consciousness tape-cutting techniques and real-time pitch-shifting using amplification on both instruments and voices. The material was a combination of newly-written music with found text and existing material from previous work. These are discussed in Chapter 7 – Tape-cutting. Most of the second year was spent preparing and researching the source text, including conversations with people who knew Sarah Kane. This included researching mental health diagnosis and treatment, literary and cultural references in Kane’s text, and thorough analysis of structure, narrative and dramaturgy in the source text (various working diagrams can be found here and here). The composition process followed this. Year 2 was also spent appointing the team, including the Director, Conductor and Ensemble, and auditioning and contracting the cast, in collaboration with the Royal Opera. Two days of workshops in GSMD Milton Court Rehearsal Room 3, led by director Jo McInnes. Jo McInnes was one of three actors in the first production of 4.48 Psychosis at the Royal Court Theatre in 2000, and in the subsequent tour. These workshops involved seven current or former drama students from GSMD and Emily Edmonds, one of the ROH Jette Parker Young Artists who was part of the opera cast. Most of the participants had previously worked with Jo McInnes on a GSMD production of 4.48 Psychosis, so they knew the text and her working methods prior to our workshops. These workshops were focused on read-throughs of the whole text, exploring the emotional world of Sarah Kane’s piece, and then focussing in on the dialogue scenes between Doctor and Patient (Scenes 6, 10, 12 and 23). These are discussed in more detail in Chapter 8. These consisted several sessions totalling around four hours with Berlin-based new-music percussionist Matthias Engler, mainly focussed on techniques with the orchestral bass drum (see Chapter 8) tubular bells and bowed metallic instruments (October 2015). These workshops were not documented. A session with Berlin-based singer Ruth Rosenfeld and sound engineer Matthias Kirschke, exploring live pitch-shift techniques, mainly applicable to Scene 17 (not discussed in this commentary). This workshop was not documented. 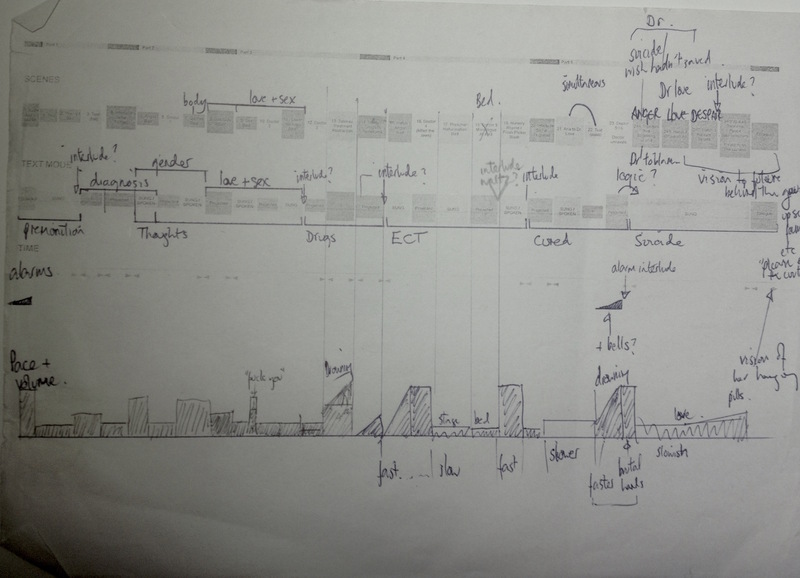 The final year consisted of completing the composition of the opera, which was submitted scene by scene through January to March 2016, following the workshops detailed below. The vocal score and instrumental parts were prepared, and rehearsals and performances happened in April and May 2016. A two-hour session at GSMD with Junior Fellow George Barton, which focussed on cymbal and tam-tam techniques, particularly bowed cymbal. This workshop was not documented. Five days of workshops in the GSMD Milton Court Studio Theatre, led by the conductor. These workshops enabled a read-through of most of the material that was already complete from the opera. There was a full cast of six vocal students from GSMD, and for three sessions we had a complete instrumental ensemble of GSMD Students. The creative team were in attendance for some or all of the week, including director, designer, senior producer and ROH management. Five sessions with the singers on scenes 2, 3, 5A, 5B, 7, 9, 13, 15, 16 and 17. Selected workshopped scenes are discussed in Chapter 4 – The ‘Opera Thought Bubble’, Chapter 6 – Mid-Phrase Switching, and Chapter 7 – Tape-cutting. One session with two percussionists and a projector on scenes 6, 10 and 12. This is discussed in Chapter 8 – Percussion Dialogues. Three sessions with tutti cast and ensemble, to put together scenes 3, 7, 8, 9, 13, 15, 16 and also read-through ensemble music in Scenes 4 and 20. Scenes 3 and 9 are discussed in Chapter 6 – Mid-Phrase Switching. Rehearsals for the opera happened in Rehearsal Room 1 at the Lyric Theatre Hammersmith, London. Running up to the rehearsal period, many of the cast received individual coaching from ROH vocal coaches, from the conductor and director. Questions about the score were fielded to me via the conductor and director, and some decisions about certain interpretations were made, provisionally, at that stage. However, none of these was to do with the issues discussed in this commentary. One week of music rehearsals in Studio 1. During this week two days of studio recording ran alongside music rehearsals, which involved both tutti recording and solo recording, of spoken voice and sung material, as well as other effects required in the score such as breathing gasping, choking, whispering. These sessions are discussed more in Chapter 7 – Tape-cutting. Three weeks of staging rehearsals in the rehearsal room, leading to a room-run of the opera on the last day, attended by ROH and GSMD artistic teams, with feedback offered afterwards. Tech week in the theatre, which included three Stage & Piano sessions, three sessions of Orchestra only rehearsal and one Sitzprobe in the rehearsal room. Following that, there were three Stage & Orchestra rehearsals and then one General (dress) rehearsal with around 100 attendees, after which we also received feedback from John Fulljames (ROH), Simon Kane and selected attendees. There was one preview performance on 23rd May 2016, then the premiere/press night on 24th May 2016 and three subsequent performances on 26–28 May 2016.